Are you one of the select few that think reindeer smell better than people? If you said yes, then you have either been hanging out with some smelly people, or you found some incredible smelling reindeer. 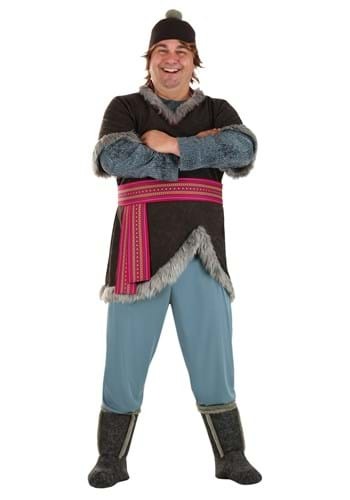 Or, we suppose you could also have the nose of a natural mountain man, in which case, you'll fit perfectly into this Plus Size Kristoff Deluxe Costume, from Disney's Frozen! Staying warm in the inhospitable chill takes a bit of practice and grit, but if you want some really toasty style, breaking out this comfy looking costume should do the trick. The polyester v-neck tunic and boot covers have the appearance of fur-lined leather, while the matching hat features a big pompom on top, and looks like it will keep your noggin nice and cozy. It's a great style for a group costume with a reindeer. Or, maybe you'll find someone in an Anna costume to warm up your icy mountain man exterior!